If you want to run regularly, but often experience knee or joint pain because of the heavy, unfriendly road impacts, then Proform 505 CST Treadmill can be the perfect solution that you have been looking for. It is a treadmill that has been designed with a sophisticated running surface, featuring the ProShox Lite 3 Cushioning to maximize joint protection and comfort for the runner. For sure, it will not give you any pain because of prolonged running. But that is not the only cool thing about Proform 505 CST Treadmill. It is also armed with various workout apps, and it is compatible with the iFit online app. Through iFit, you can connect with other users and compete against each other. Speaking about making exercises more fun and challenging! In terms of design, Proform 505 CST Treadmill may appear like your typical treadmill. But it has been designed with subtle details that make its usage very comfortable and pleasant. We have mentioned about the ProShox Lite 3 Cushioning technology implemented in the running surface; the cushioning is soft and cushy to allow you to run comfortably, free from the problem of joint pain. The running surface measures by 20” x 55”. It is wide enough for most people. Just under the control panel, there is a pair of handle bars with slightly rounded edges. 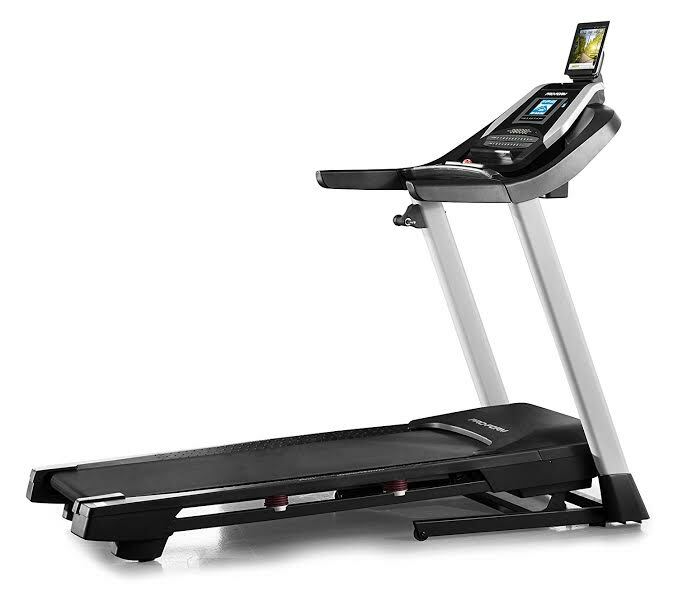 The total length of the treadmill is 70”, with 59.5” height and 34” width. At 186 lbs, it is rather bulky and heavy. But we really like the 6” LED display screen because the display screen is backlit. Thanks to the backlighting, you will be able to see and operate the machine even in a darkened environment. Proform 505 CST Treadmill has been packed with cool features, too. There is a built-in music port, compatible with iPod and MP3 player, to allow you to run while listening to some up-beat, energizing music. There are 15 built-in workout apps to keep you challenged with your workout programs, and you can also customize your own fitness programs here. With the iFit app, you can connect with other users to compete and challenge each other. However, keep in mind that the iFit app requires you to purchase an optional adapter, required by the machine in order to connect with the Internet. Proform 505 CST Treadmill is powered by the 2.5 chp Mach Z commercial motor, able to provide a running speed of up to 10 mph. Changing and adjusting the speed is very easy, thanks to the intuitive control and design. The incline level of the running surface is also adjustable, from 0% up to 10%. Changing the incline level is also very easy and simple. Proform 505 CST Treadmill performs the math for you by tracking the calories burned as well as your heart rate (via the pulse grips), so it will be much easier for you to track your progress. • ProShox Lite 3 Cushioning that maximizes joint protection and provides enhanced comfort. • Space saver design allows the deck to fold for easy storage. • iFit technology compatible, allowing you to enjoy workouts powered by Google Maps. You can get workouts made by Jillian Michaels or customize your own fitness programs. • Incline from 0-10%, adjustable with just the push of a button. • Speed from 0-10 mph, powered by the 2.5 CHP Mach Z motor. • Heart rate monitoring performed through pulse grips. • Music port for iPod or MP3 player. • 6” backlit LED screen. • 15 workout profile programs. Check the best price of Proform 505 CST Treadmill here!